As an aspiring English gentleman on limited means, G.M. Norton aspires to better himself in the ways of old while showing the world that old-fashioned doesn’t mean outdated. When he’s not doffing his hat around the fine city of Manchester, he can be found spear in hand as he continues on his quest to lead a gentlemanly existence. As a stickler for punctuality, G.M. Norton writes a blog post every Saturday at 4 o’clock over at his online periodical Norton of Morton. He also witters on Twitter @nortonofmorton. Look out for his new gentleman’s column in independent magazine Pretty Nostalgic this coming March and for his contributions to Vintage Manchester. As employing staff to take care of my shoes is out of the question (although training up my two children is an option and they do have the pre-requisite rosy cheeks), it is necessary for me to take matters into my own hands and do the job myself. 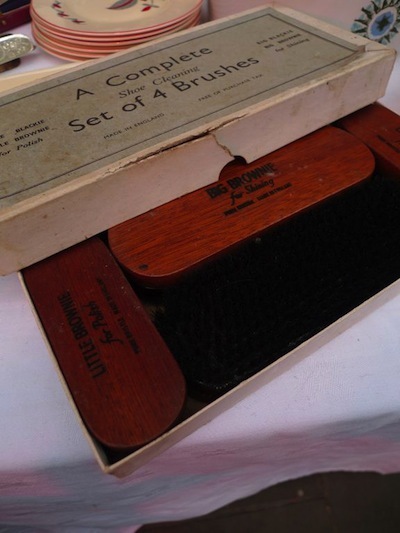 That’s when good quality shoe brushes are needed like the ones I spied on my arrival to the fair. Shiny shoes put an extra spring in a gentleman’s step so I hope these lovely brushes made the lucky buyer extra springy. As music downloads started to replace the CD format, I began to lose faith with the soulless concept being bandied about and longed for a return to those happy memories of flipping through huge piles of old records and discovering ‘new’ music for my ever-eager ears. So I made the decision to turn to vinyl. 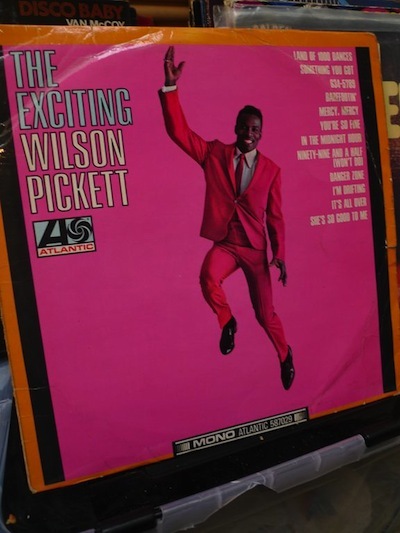 I simply love Motown and Stax records so when the opportunity presented itself to become the proud owner of a Wilson Pickett LP, I could hardly turn it down. Especially for the princely sum of £5. This atomically designed teller of time instantly caught my eye. Made in the Soviet Union, it was a chance for a fabulous fairgoer to claim a slice of authentic space-age history. If my frugal funds had allowed, this clock would have been transported back to my abode quicker than Neil Armstrong raced to be the first one out. 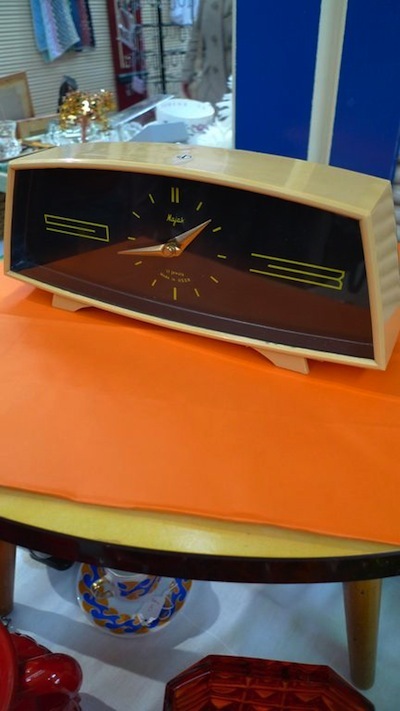 I simply adore space-age design and this alluringly shaped clock is a super example of this 60s era. Extremely friendly stallholders too, it was a pleasure to make their acquaintance. 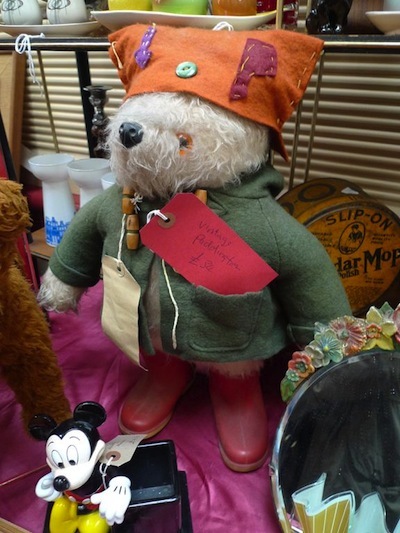 Forget Peppa Pig or Oopsy Daisy, Paddington Bear is a cuddly toy worthy of taking up space in your home. Paddington Bear is fondly-remembered for his duffle coat, battered suitcase and love of marmalade sandwiches. He was also impeccably polite too, an example for would-be gentlemen up and down the land. For that reason alone, a very worthy purchase. Always keen to be well-presented, it is practically impossible to own too many ties. 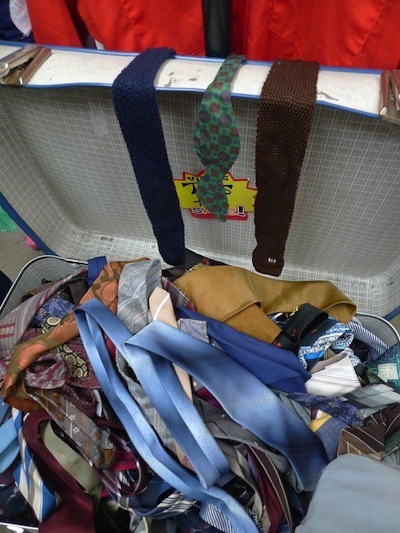 As something of a clothes-addict and bargain hunter, I was soon rooting through the suitcase of ties available from a joy-inducing £1. [Editor back again]: Wasn't that a treat? Our fervent thanks to Mr Norton for compiling such an alluring assortment of treasures! Do call again soon! As the writer of an analogue periodical in a digital age, the iconic Roberts radio ticks all the boxes for me. 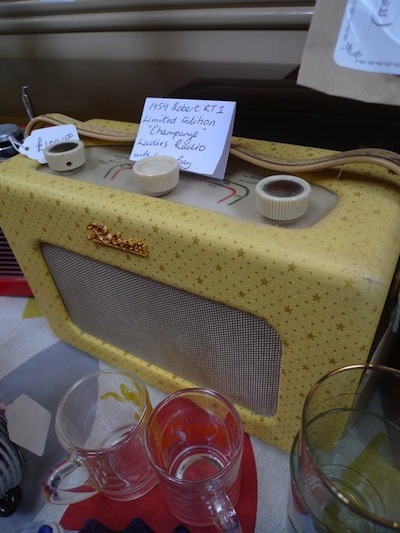 Roberts radios simply ooze Britishness – apparently, the Queen Mother even used to present them to foreign dignitaries. It is the first time I’ve had the pleasure of being within touching distance of one of these beauties and suffice to say, it lived up to all my expectations. This transistor model is an RT1, circa 1959 and has a highly unusual original covering. I would love to know the first song it ever played. For the last two centuries, notebooks have been used by the great artists and thinkers including Vincent van Gogh, Ernest Hemingway and Pablo Picasso. As somebody who seems to have a constant stream of ideas and plans (combined with an unnecessary urge to doodle), I’ve recently taken to carrying a notebook around with me so I can jot away. On a recent visit to a well-known stationery emporium, I was disappointed to find a lack of design options for the gentleman about town so I ended up with a handsome, but rather dull affair. 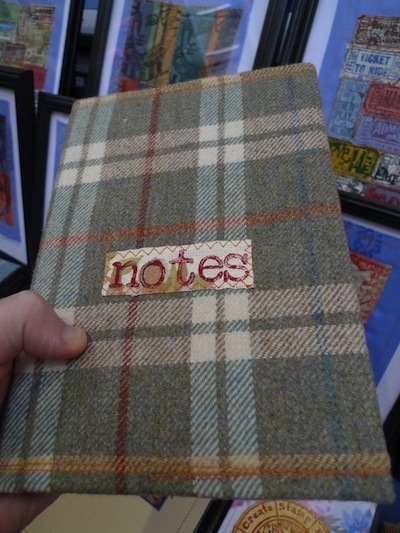 If only I had stumbled across the notebooks offered by Mr. James Sharp, bound up in such lovely fabrics. I have a feeling ones of these notebooks will become my next trusted and handy travel companion. In the field of combat, a quick swig from a hip flask was rudimentary self-medication to fuel courage, eliminate fear, and banish pain. 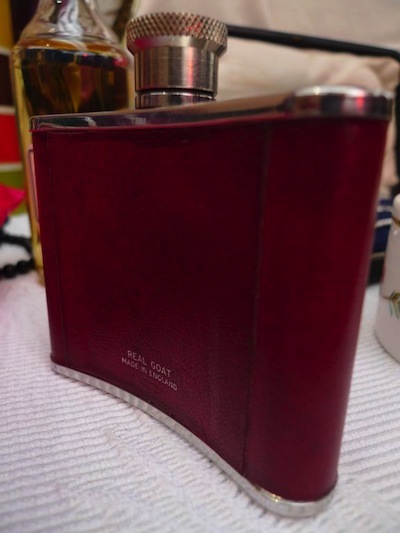 To prepare myself should I ever accidentally stumble onto a patch of grassy earth where an historical re-enactment is underway, I had no choice but to snaffle this charming hip flask. Made in England from real goat and stainless steel, I can’t wait to fill it with my tipple of choice and see where it takes me. Let’s hope it’s not to an Alcoholics Anonymous meeting. Salute. 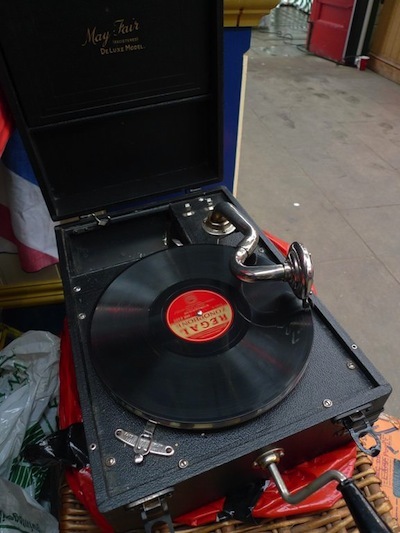 As I alluded to earlier, I listen to vinyl records so I was naturally drawn to the gramophones offered by Jim who kindly obliged my request to play a George Formby number. Listening to a record is like borrowing a piece of nostalgia from a simpler, pre-internet age. The three wind-up ‘wheels of steel’ on offer had all been lovingly restored and for the reasonable prices they were available to buy, it provided an opportunity for three lucky blighters to own a piece of musical history. One of the greatest pleasures for any chap or chapette is the rich aroma of freshly brewed coffee permeating the air, wafting itself through the home and scintillating the senses. Even if you don’t like the stuff, there’s something about the smell that is utterly divine. 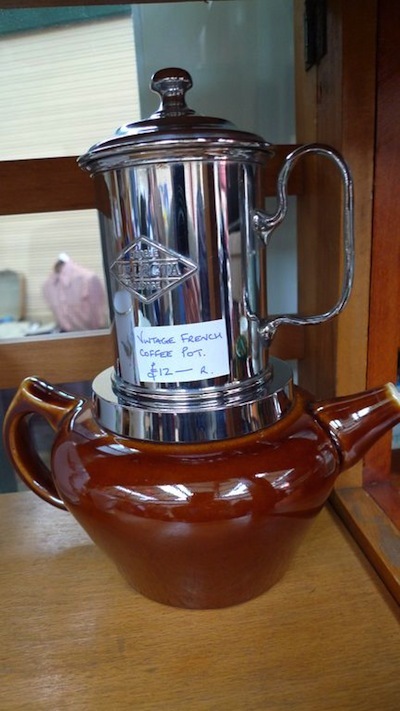 This French coffee pot looks stylish and sturdy and for the bargain bounty on its spout of £12, anybody who turned their nose up at it needs to wake up and smell the coffee. Being as English as tea and crumpets, I eat a lot of cake in the hope that it will one day become an Olympic sport. As a serious cakeathlete (I think I’ve just invented a word by putting two together), one must have adequate tools to train for future national representation. 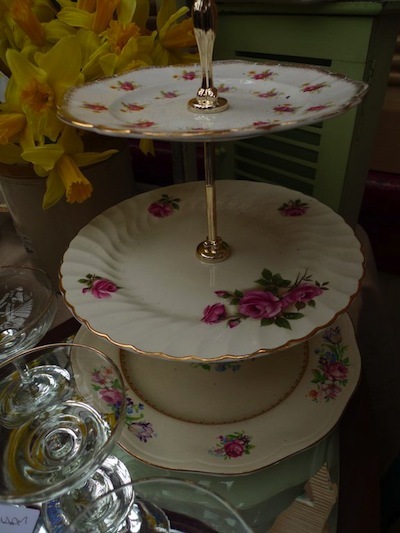 This jolly nice cake stand would look just the ticket back at Chateau NoM, especially with enormous slabs of cakes resting precariously on each level. I suspect the sugary goods wouldn’t last very long but this item will stay standing ready for the next baked onslaught.